Seleukid Kingdom. Philip Philadelphos, 93 to 83 BC. Silver tetradrachm. Unusual portrait. Reference : Sear-7196 but unusual style. Size : 25.6 x 27.0 mm. Weight : 15.85 grams. Obverse : Head of Philip Philadelphos right. Reverse : Zeus seated left on a throne, with BASILEWS FHILIPPOY to the right, and EPIWANOYS FILADELFOY to the left . This coin has a rather unusual portrait of Philip Philadelphos, which is much more life like than usual. The portrait actually look to be that of Antiochos XI, who was defeated by Philip in 93 BC. 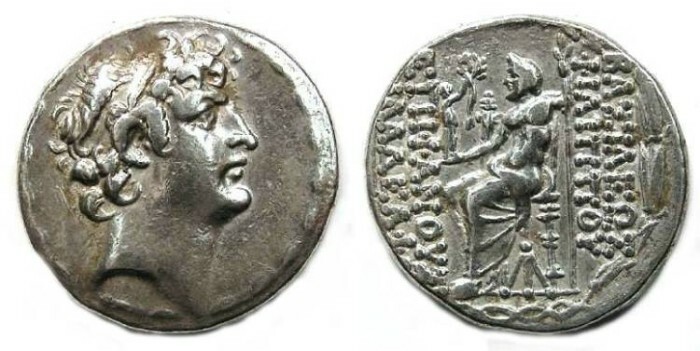 This has to be one of the earliest coins of Philip and the obverse die may actually have been intended for a coin of Antiochos XI and was left over in the mint at the time of his defeat.